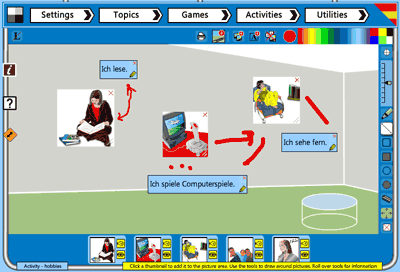 With our Italian Picture Mixer teaching activity for the topic "Colours" you have an interactive board for playing with the pictures and language for the topic "Colours". The pictures can be added to the screen, grouped, moved, annotated and put on different backgrounds with multiple floating texts. 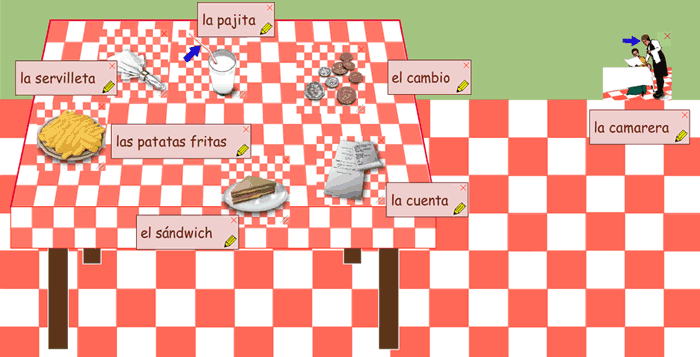 See the table below for the topic language. The The picture mixer combines tools for adding and grouping topic pictures and texts with annotation and background images. The picture mixer enables you to load all or a selection of pictures in a topic as draggable, resizable pictures. You can also add all or some texts related to those pictures. You can select from a range of backgrounds, some of which are specific to individual topics. 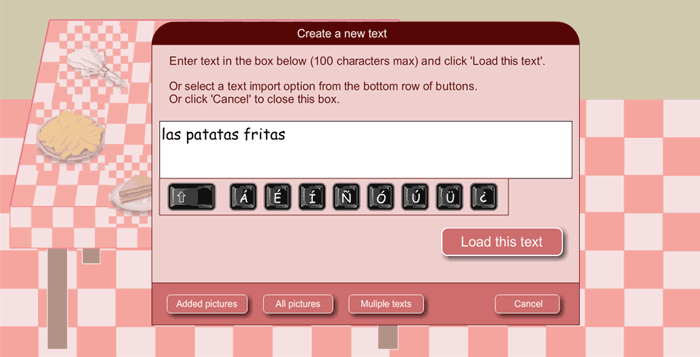 Added texts can be edited - special characters are supplied for each language. You can choose to add single texts, texts for all the pictures in the picture area, all texts in a topic or even a custom list of texts pasted from another program. On the Settings page select a topic and the number of pictures to use. It is sometimes better to work with half a topic at a time as the number of pictures is then more manageable (this is especially true of intermediate topics). Click on the 'Let's Teach' button to enter the activity. The large white box is your picture area. Add an instance of a topic picture by clicking on its thumbnail at the bottom of the screen. You can add up to 10 instances of any particular picture. Resize the picture using the drag handle at bottom right. Clear the instance using the red cross at top right. Move the instance by clicking and dragging anywhere within the instance. Hide all instances of a picture using the eye button of that picture in the bottom bar. Play the sound file for the picture using the loudspeaker button. Add an instance of each thumbnail using the 'Add all thumbnails' button in the top toolbar. To create text/s, click on the 'Add text' button in the top toolbar. You can create individual texts by typing in the box (special characters supplied) or by pasting into the text box (Ctrl V). To load the label texts for all the pictures in the picture area, click the 'Added pictures' button. To load the label texts for all the thumbnails click the 'All pictures' button. You can also paste or type in a semi-colon delimited list of texts to be added by clicking on the 'Mulitple texts' button. Any text instance can be edited by clicking on its pencil icon. A standard set of annotation tools is provided in the right toolbar. The line thickness slider applies to all tools that create lines (straight line, pen, empty shapes). Colour the picture area a solid colour using the 'Colour the background' button with your desired colour selected in the colour picker at top right. The eraser tool erases portions of your annotations only (not added pictures or backgrounds). The 'Clear all annotations' button clears all annotations but not a coloured background. This module is supplied with many backgrounds that you can use for particular activities - these include storyboards, heads and figures, topic specific backgrounds etc. You can copy text from the label at top left and paste it into a new text instance to quickly create instances of particular texts. When creating texts you can use both your physical keyboard and the on-screen keyboard interchangeably. Letters can also be deleted using standard keyboard keys. Some characters are blocked and will not appear in the Text area - this is for security reasons - examples include brackets, asterix, hash, etc. Select the topic you would like to use by clicking the 'Change topic' button. Choose to introduce all the items in a topic at once, or just the first or second half of the topic.